FAMILY OWNED. FAMILY OPERATED. Welcome to www.i-gifts.ca, the online showroom for Importer's Gifts based in Woodbridge, Ontario, Canada. Whether you are looking for Bomboniere and/or Invitations for your event, Collectibles and Gift ware or maybe something for your home or kitchen, you have come to the right place. 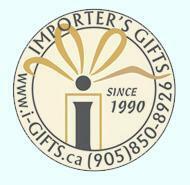 Importer's Gifts has been providing quality products and services to their clients for over 20 YEARS! Thanks to the thousands of referrals and relationships we have built, both with clients and Suppliers we are able to continually provide the service and the products that knowledgeable clients expect to find. Established in 1990 by former real estate pro Christine Colalillo, Importer's Gifts has become one of Canada's industry leaders in the retail Wedding Bomboniere and Invitations business. Are you the owner of Importer's Gifts?